Ai Phuket Hostel is the Sino-Portugese building with eastern-western style. You'll relax, enjoy, and feel love it with Phuket Culture. 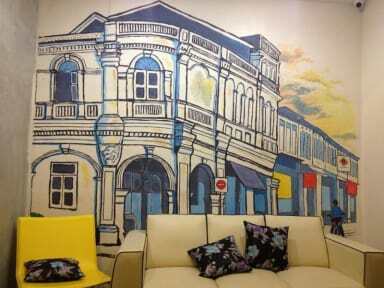 Ai Phuket Hostel is located in the city center of Phuket Old Town area. Easy to discover Tales of Charming Old Town of Phuket. 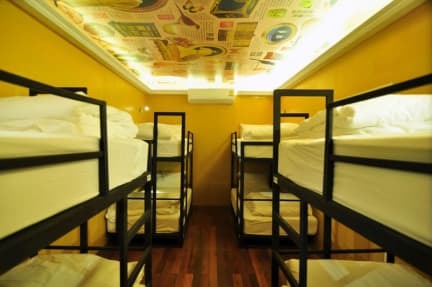 We offers air-conditioned Private rooms and Dormitory rooms. Enjoy common area with TV/DVD, Relax area, Balcony with small garden and Kitchen. We provides accessibility to important town facilities. With its convenient location, the hotel offers easy access. Opposite of Local Food Center and Mini Mart. 40-minute ride to Phuket International Airport. seating area, shared bathroom are just some of the facilities that can be found throughout the property. Discover an engaging blend of professional service and a wide array of features at Ai Phuket Hostel. The hostel features a tour desk, which organise excursion to tourist attractions. I stayed here last year for two nights and came back again because of the friendly staff! They also have good prices for ferries and buses as well. Thank you! See you again soon! Nice clean hostel in a Sino-Portuguese style building. Great location, friendly and helpful staff, and one of the only places I’ve seen in months of Southeast Asia that has a full kitchen for guest use. Met lots of fun people while staying here, walking distance to everything in Phuket Town, and cheap tickets and tours. Only quirk with my stay, had to do laundry and the washing mashing kept having an error which made it take so long, the daughter helped me twice to fix it. Very clean, comfy hostel. Quiet but good location easy to walk to cafes, shops etc. in the old town of Phuket. Staff very helpful and friendly. Good value for money! Perfect hostel. Clean, secure and good environment, what do you need more. They even have a garden. Hostel owners were friendly. It’s just not near the beach. But you go to the Patong Beach for 30 Baht. Lovely hostel, very quiet but if that’s what you’re after would definitely recommend staying here. Great kitchen, air con in rooms, lovely staff who will organise a cheap taxi for you to Rassada pier for ferries to the other islands. Nice staff. I liked its location for the few things I wanted to see in the area. There is an AC in the room which is great. The little kitchen is pretty complete to do a quick meal if needed. I totally recommend this hostel! Got here and went from an 8 bed dorm to a private because of a booking error, not an issue at all! Very helpful staff, always helping us save money. Even wrote a note in Thai for a bus driver to explain where we were trying to go! Kitchen was small but doesn’t really need to be any bigger! My second stay at this hostel. It's a medium size backpacker's hostel I marked them down on cleanliness due to three cat's that live at the hostel. Good place to stay, worth the value. Located in center of Phuket town close to walking street- not too close to the beaches though but that's okay. Wonderful staff as well. Great kitchen to use. Good air conditioned rooms. There are cats that roam around the hostel during the day which is awesome!!! Such friendly cats you are sure to get your cuddles in! Quiet place to stay got plenty of sleep overal would stay again just to see the cats! !